Despite being very young, at 25, and having no family history of balding prematurely or “bald genes,” a very good friend of mine is currently losing his hair. And he recently told me he is an excessive drinker. The average person loses 50 to 100 hairs every day. And although hair loss may be attributed to genetics and/or a poor hair care regimen that causes damage (excessive use of heat styling tools, hair dyes, etc. ), it may also be that lifestyle choices, like drinking too much alcohol, may cause premature balding. Excessive drinking deprives your body of critical nutrients, like water, protein and minerals, which are necessary for the health of your hair. And a 2013 study suggested that men who consumed more than four alcoholic drinks per week had an increased risk for temporal (above the eyebrows, commonly called a widow’s peak) hair loss. Some critical nutrients you may lose and problems you may encounter regarding your hair if you drink excessively? Water. Drinking too much alcohol may cause dehydration. Alcohol is a diuretic, which means that it stimulates urination. And urinating excessively due to heavy alcohol consumption may cause dehydration, especially if you are not drinking water in between drinking alcoholic beverages. Since hair is made up of one-fourth water, if the roots of your hair do not receive adequate amounts of water, this may cause dry, brittle hair which can lead to damage and breakage. 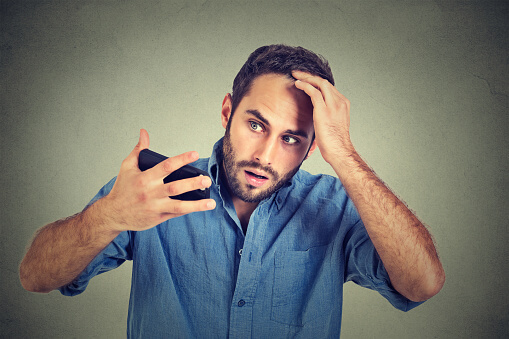 Lack of water may also stunt hair growth and exacerbate dry scalp and dandruff, which is essentially inflammation of the scalp that can lead to temporary hair loss. Iron. “Iron deficiency (ID) is the world’s most common nutritional deficiency and is a well-known cause of hair loss,” according to the National Institutes for Health (NIH). Iron deficiency has been associated with alopecia, an autoimmune skin disease that causes hair loss. Drinking too much alcohol may deplete your iron levels and make it more difficult for your body to absorb iron. Low iron levels may also lead to a condition called “telogen effluvium,” which may prevent the hair from growing and cause it to fall out. (There are two types of iron -- heme and non-heme. Heme iron is rich in lean meat and seafood. This is more bioavailable, meaning your body can use it better. Non-heme iron is found in nuts, grains, vegetables and other fortified products). Zinc. “Alcoholic beverages decrease the amount of zinc that the body absorbs and increase the amount lost in the urine. Also, many alcoholics eat a limited amount and variety of food, so they may not get enough zinc,” according to the NIH. One of the signs of zinc deficiency is hair loss. To learn more about zinc and good food sources of this essential trace mineral, read here. General Nutrient depletion. The overconsumption of alcohol is extremely toxic to the liver. The liver is an organ that processes nutrients and is also mainly responsible for metabolizing alcohol. “The process of metabolizing alcohol requires nutrients. As the liver decreases its supply of these nutrients, the blood stream is called upon to replenish the supply. As a result, body cells are deprived of critical nutrients and normal body functions suffer,” according to Boulder Medical Center. For example, excessive drinking diminishes stores of antioxidants in the body, like vitamins C, E, and D, which can ultimately contribute to hair loss. Estrogen Imbalance. There is evidence that excessive drinking may cause elevation of estrogen levels. Maintaining hormonal balance in the body can be tricky, and either too much or too little of certain hormones can have negative effects on the body. For example, too much estrogen can cause hair loss. This is why pregnant women (whose estrogen levels are higher) often experience temporary hair loss. At the same time, menopausal women tend to lose hair due to a lack of estrogen. Foods that may help balance estrogen levels include flaxseed, cruciferous veggies (like kale and broccoli), good fats (like those found in avocados and almonds), salmon and eggs. Some suggestions on how you can be proactive? Know your limits. Recommended alcohol consumption amounts are different for males and females. According to National Institute on Alcohol Abuse and Alcoholism (NIAAA), men should have no more than four drinks on a single day and no more than 14 drinks per week. Women should have no more than three drinks on a single day and no more than seven drinks per week. You need to be especially careful if you are over the age of 65. Older adults should have no more than three drinks on a single day and no more than seven drinks per week. Ensure you are nutritionally balanced. You should make sure your nutrients are balanced by getting a comprehensive nutrient test. For example, having too much zinc in the body may contribute to hair loss as well. If you do have nutrient deficiencies and imbalances, you may have to tweak your diet, take good quality supplements or even consider the use of liposomal technology. Also be aware of any medications you are taking (both prescription and over-the-counter), as these may deplete vital nutrients from your body. So some people might say: “If you booze, you lose.” This may also be true when it comes to your hair.